This single-cylinder engine originally powered an “Australis” motor car, one of the first petrol-powered automobiles to be made in Australia. It was manufactured by G.W. and G. Wood, in the inner-Sydney suburb of Leichhardt in 1900. Although credit for producing the first petrol car in Australia has been given to Harry A.Tarrant of Melbourne in 1897, this Australis engine may be the oldest surviving Australian-made petrol-driven automobile engine. Four-stroke, single-cylinder automobile engine, water-cooled, with a mechanically operated exhaust valve and automatic inlet valve. The Australis car engine was made by G.W. and G. Wood, engineers and motor car manufacturers of Leichhardt in Sydney. The firm was established in 1893 by George Winter Wood (1870-1957) a bicycle manufacturer at 67 Marion Street, Leichhardt, known as 'The Cycleries Engineer and Cycle Maker'. George W. Wood was born in Wakefield, Leeds, England, and arrived in Australia at the age of 16. In 1895 George went into partnership with his father, George Wood (1835-1908), as G.W. and G. Wood and moved the business to 355 Parramatta Road, Leichhardt. From 1895 the firm had been adding engines to bicycles and in 1896 Charles Highland, an electrician, of Market Street, Sydney, imported a 1.75 horsepower De Dion Bouton air-cooled engine. The Wood company disassembled this engine and patterns were made from the parts by John Danks Pty Ltd. From the castings Messrs Wood then machined and produced their first petrol engine. The four-stroke engine was air-cooled, with a bore of two inches (6.3 cm) and stroke of 3 inches (7.6 cm), and an automatic inlet vale and mechanical exhaust. The original drive was by chain but later converted to a flexible belt. Ignition was by trembler coil and dry batteries. The tank was divided into three parts, the centre housed the batteries and coil, the front part was for oil and the rear for petrol. Controls were mounted on the top tube of the bicycle frame. There was no carburettor attached directly to the engine, instead it had the unusual arrangement of the petrol tank which served both as a carburettor and fuel tank. A rotary throttle valve was situated at the top corner of the tank and connected to an induction pipe. Air was drawn into the tank by the suction stroke of the engine regulated by a rotary valve. The air then passed down a tube from the valve to half way down the tank. Inside the tube, another sliding tube with a cork float attached to the bottom, sealed the tube so that incoming air had to surge under the float. Passing through the petrol it became a gas of the correct mixture. The Wood firm later designed and manufactured their own automatic carburettors in 1900 which were fitted to all their subsequent vehicles. The original De Dion Bouton engine was then reassembled and mounted on a quadracycle, a copy of a French pedal-powered Gladiator quadracycle, and made for Highland by the Woods in 1897. Highland is credited with being the owner of the first four-wheeled motor vehicle in Australia. In 1900 the Wood firm moved to 361 Parramatta Road, Leichhardt. After the manufacture of their first gas engine, the firm's name changed to the Austral Gas Engine Works. The first car to be made at the new works was known as the "Australis" auto car. After that all motor vehicles made by the firm were called Australis. A number of motorcycles, bicycle conversions, early style cars called fore-cars, as well as motor vehicles were made. 1905 Motorcycle forecar (conversion of the De Dion motor tricycle to a four-wheeled forecar for W.J. Knowles). The design and manufacture of the Australis automobile from which this engine originated was begun by the Wood firm in 1899. All mechanical parts were made at the manufacturer's workshop including the engine, the steel tube chassis, transmission, spark plug, trembler coil and battery. The engine was cast by John Danks Pty Ltd; the springs were made by John While of Petersham; the forgings by Carr, a local blacksmith; the bodywork by Fludder's timber mills of Petersham; and the tyres, 28 inch (71 cm) x 2 and half inch (6.3 cm), by the Rapide Tyre Co. The 3 hp, 4-stroke engine had steel timing gears, contact breaker points of pure platinum, a spark plug built up with mica washers and platinum tipped points. The exhaust valve was mechanical and the inlet valve was a spring-loaded automatic type. 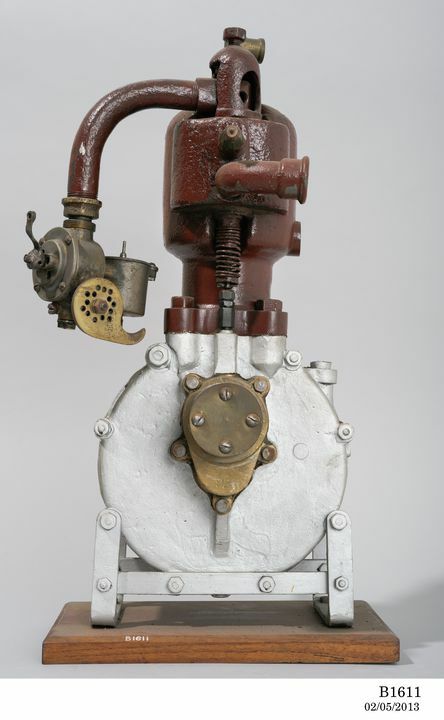 The carburettor arrangement was a Wood family design and consisted of a jet chamber with a valve seat at the bottom and around this was a series of small holes. A spring-loaded valve closed the holes on the seat and fuel was regulated by a needle valve. It was automatic and did not use a float. The engine was first successfully run with air-cooling but later changed to water-cooling. The car itself was a two-seat model with a conventional steering wheel. A leather cone clutch was used, controlled by a foot pedal, which also operated the foot brake by pressing the pedal further down. The handbrake was operated by a lever from outside the body of the car. The gear change lever, throttle and ignition controls were located on the steering column. Double dog clutches were housed in the gear change box on the counter shaft and double chains provided the two-speed gear ration with two sprockets on a differential axle. Full elliptic springs were used with transverse ones on the front only. In 1907 the Wood firm moved to 401 Parramatta Road, Leichhardt, trading as Australis Motors. The following year George W. Wood entered into a partnership with H. May. The business then became May and Wood and the allotment next door at 399 Parramatta Road, was purchased. A large premises, built by May's father, was erected with accommodation for the Wood and May families in separate residences upstairs. The partnership only lasted for 2 years before George Wood left and reopened his business in the old Queens Theatre at 560 Parramatta Road, Petersham. The car from which this engine originated was the first "Australis" car made by G.W. and G. Wood in 1900. Design and construction of the car began in 1899 with road tests undertaken in June 1900. After travelling many miles in and around Sydney it was sold in July 1903 to Jurgen Adolf Thomsen from the New South Wales south coast town of Nelligen. Thomsen was a German immigrant, born in 1832 in Flensburg, Schleswig-Holstein. It appears he may have arrived in New South Wales in 1854 on board the "Alma and Olga" from Hamburg as a sailor. He was married the next year in the gold mining town of Majors Creek, near Braidwood, raised a large family there and at Buckenbowra and was involved in gold mining and speculating. Jurgen Thomsen purchased the Australis car when he was 68 years of age. An extract from the Wood company ledger indicates that the car cost Thomsen £120 to purchase. Extras included £1 for a drum of petrol, 1 Pound for a set of dry cells (battery), 1 shilling and 6 pence for a one-gallon can, 5 shillings for a gallon of motor oil, and 4 Pounds and 10 shillings for the trip to Nellingen to provide driving lessons. The Australis car was delivered to Batemans Bay in 1903 by the steamer "Eden" and driven to Nelligen by Bill Duffield, a marine engineer. The car used Pratt's petrol. Jurgen Thomsen died in 1911 at Nelligen, only 8 years after he took possession of the car, and was buried at Nelligen cemetery. The engine was removed from the car in about 1910 by Jurgen Thomsen's son Berry (Berthol) for use in a boat. (In 1904 Thomsen Brothers, Berthol and August Thomsen, were listed as carriers at Batemans Bay). The engine was used in the boat for about 10 years then removed and later given to Thomsen's son-in-law, Francis Stephen Irwin, of Wollongong who donated the engine to the Museum in 1965.